Estrellas de la Calle (E.D.L.C.) is the original Rap/Rock old school of chilean Rappers with the genuine crossover urban music. Born in 1991 playing through various formations and creative periods until 1998 with his musical work and shape the hiphop activist movement of the VIII region. This group will come out top talent as rapper MC Charlie Flowers that will continue the legacy of this band in groups like Apatrida & Aboriginal , and throughout his solo career, and the musicians Boris Cea ( Tollarto - Pilgrimage of the holy fortune , etc.) Nielsen Berlinger ( De javu -Fe rats etc.) and visual artist Lucho Almond , who walked his plastic and performance given by different parts of the world. 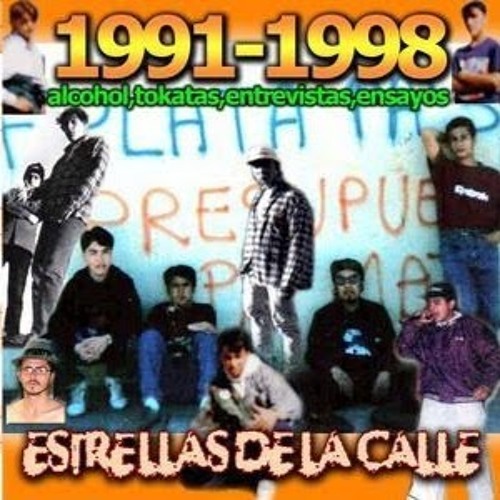 Estrellas de la Calle ( EDLC ) es la vieja escuela original Rap / Rock de raperos chilenos con el cruce de la música urbana genuina. Nacido en 1991 de juego a través de diversas formaciones y periodos creativos hasta 1998 con su obra musical y dar forma al movimiento activista hiphop de la VIII Región. De este grupo saldrán grandes talentos como el rapero M.C. Charlie Flowers que seguirá con el legado de esta banda en agrupaciones como: Apatrida & Aboriginal, y a lo largo de su carrera solista, y los musicos Boris Cea (Tollarto-Romeria de la santa fortuna, entre otros)Nielsen Berlinger(De javu-Fe de ratas entre otros) y el artista visual Lucho Almendra, quien a paseado su propuesta plástica y performance por distintas partes del mundo.